The Screen Award for Best Actor - Popular Choice has been introduced in 2009 during the Screen Awards. Unlike the Screen Award for Best Actor which is chosen by the jury, this trophy is given by the viewers to the actor whose performance is judged the most popular. Akshay Kumar was the first winner for his performance in Singh is Kinng in 2009 but he did not accept his award and gave it away to Aamir Khan for Ghajini who thought he deserved it more. Shah Rukh Khan has won five times (2011, 2012, 2014, 2015, 2016) in the last six years thus making him the most Awarded Actor. Rajiv Hari Om Bhatia, known professionally as Akshay Kumar, is an Indian born Canadian actor, producer, television personality, martial artist, stuntman and philanthropist who works in Bollywood films. In a career spanning over twenty five years, Kumar has appeared in over a hundred films and has won several awards, including the National Film Award for Best Actor for his performances in Rustom and Airlift, and two Filmfare Awards for Ajnabee (2001) and Garam Masala (2005). 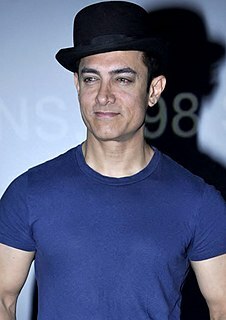 Mohammed Aamir Hussain Khan, widely known as Aamir Khan, is an Indian film actor, filmmaker and television talk-show host. Through his thirty-year career in Hindi films, Khan has established himself as one of the most popular and influential actors of Indian cinema. He has a large global following, especially in Southern Asia and Greater China, and has been described by Newsweek as "the biggest movie star" in the world. Khan is the recipient of numerous awards, including nine Filmfare Awards, four National Film Awards, and an AACTA Award, as well as an Academy Award nomination. He was honoured by the Government of India with the Padma Shri in 2003 and the Padma Bhushan in 2010, and received an honorary title from the Government of China in 2017. Vishal Devgan, known professionally as Ajay Devgn, is an Indian film actor, director and producer. He is widely considered as one of the most popular and influential actors of Hindi cinema, who has appeared in over a hundred Hindi films. Devgn has won numerous accolades, including two National Film Awards and four Filmfare Awards. In 2016, he was honoured by the Government of India with the Padma Shri, the fourth-highest civilian honour of the country. Juhi Chawla is an Indian actress, model, film producer, and the winner of the 1984 Miss India beauty pageant. She has received several awards including two Filmfare Awards. Chawla has worked predominantly in Hindi language films, in addition to Bengali, Punjabi, Malayalam, Tamil, Kannada and Telugu language films. She is one of the most popular actresses of Hindi Cinema, and garnered particular praise for her comedic timing and vivacious on-screen persona. Sāhibzāde Irfan Ali Khan, also credited as simply Irrfan, is an Indian film actor, known for his work predominantly in Hindi cinema, as well as his works in British films and Hollywood. In a film career spanning almost thirty years and featuring in more than fifty domestic films, Khan has received numerous awards, including a National Film Award and Filmfare Awards in four categories. Film critics, contemporaries and other experts consider him to be one of the finest actors in Indian cinema for his versatile and natural acting. In 2011, he was awarded the Padma Shri, India's fourth highest civilian honour for his contribution to the field of arts. Adnan Sami Khan is an Indian singer, musician, music composer, pianist and actor. He performs Indian and western music, specially for Hindi movies. His most notable instrument is the piano. He is credited for being the first person to play Indian classical music on the piano in a style he created through the Santoor. A review in US-based Keyboard magazine described him as the fastest keyboard player in the world and called him the keyboard discovery of the nineties. As a multi-platinum recording artist, he has sold the biggest selling independent albums of all time in India. He can play over 35 musical instruments. Feroz Khan was an Indian actor, film editor, producer and director in the Hindi film industry. He was popular for his flamboyant style, with cowboyish swagger, and cigar-toting persona; this revolutionised the style quotient of the otherwise conventional "filmi" hero. He is known as the "Clint Eastwood of Bollywood" for introducing Western cowboy & dacoit style films. Mirza Nazeer Baig Mughal, better known by his stage name Nadeem Baig is a Pakistani actor, singer and producer. Since the beginning of his career in 1967, he has appeared in over two hundred films and has won various awards, including the 1997 Pride of Performance award. He is one of the most influential actors in his country. Feroz Abbas Khan is an Indian theatre and film director, playwright and screenwriter, who is most known for directing plays like Mughal-e-Azam, Saalgirah, Tumhari Amrita (1992), Salesman Ramlal and Gandhi Viruddh Gandhi. Tanay Hemant Chheda is an Indian actor. He is best known for his child performances in the critically acclaimed films Taare Zameen Par (2007) and Slumdog Millionaire (2008), with the latter earning him the Screen Actors Guild Award for Outstanding Performance by a Cast in a Motion Picture and a nomination for Best Ensemble at the Black Reel Awards of 2008. Girish Pandurang Kulkarni is an Indian film actor, writer, and producer. He is a recipient of two National Film Awards namely, National Film Award for Best Actor in 2011 for his performance in ￼￼Deool and National Film Award for Best Screenplay for the same film. He is well known for Marathi films such as Valu, Vihir, Deool, Gabhricha Paus and Jaundya Na Balasaheb. He is known to Hindi audiences for his role in the Aamir Khan starrer Dangal and Anurag Kashyap's movie ugly. He received acclaim for his portrayal of gangster 'Appa' in the 2017 Marathi crime thriller Faster Fene opposite Amey Wagh. He also starred as politician Bipin Bhonsle in the 2018 India's first Netflix Original series Sacred Games. Khans of Bollywood is a term used to describe leading male actors of Bollywood, the Mumbai-based Hindi language Indian film industry, whose surnames are Khan. This term is most often used specifically for the Three Khans: Shah Rukh Khan, Aamir Khan and Salman Khan. The three are unrelated, but happen to share the same surname, and were all born in 1965.